The precise origin of the regiment which was first known as the "Continental Guard", but after the date of it's muster, as the Forty-Eighth Regiment New York State Volunteers, is difficult to determine. Lieutenant-Colonel Barton and Quartermaster Avery deserve perhaps the credit of the very first thought. In the spring of 1861, on President Lincoln's calling for seventy-five thousand men in Brooklyn. They rented a room in old Montague Hall, on Court Street, and advertised for recruits. Soon they had more responses than sufficed for a company, and with a fine courage they determined to raise a full regiment. In response to such an announcement they received letters from some of the future officers of the Forty-eighth, saying, "We have a number of men on hand ready to join a good regiment: who is to command it?" That was a question they found it necessary to decide at once. At that time it was announced in Brooklyn that the Rev. Dr. James H. Perry, a pastor of the Pacific Street Methodist Episcopal Church, --a clergyman well and widely known throughout the city, --had determined to tender his sword to the Government, for service in its defense. In the public Conference he had declared that as he had been educated at the expense of his country at West Point, he felt that she had claim upon him for any service he could render her in her hour of peril. It was a happy thought of Messrs. Barton and Avery to tender to Dr. Perry the command of the regiment they had started to raise. They received promptly the following answer: "I have given the matter careful consideration. Our country needs help; these are dark and serious days before it, and this rebellion must be crushed. If you think you can raise the number of men requisite for the formation of a regiment, and will attend to the detail of recruiting,....you can use my name as Colonel." These seem to have been the circumstances of the origin of the brave and heroic company of Union soldiers which became known in history as the Forty-eighth New York. The names of Lieutenant-Colonel William B. Barton, Quartermaster Irving M. Avery, and Colonel James H. Perry deserve to stand at the head of its honorable roll. And yet there were other units of company organizations, which had distinct origins, but which afterwards were joined to the forces that were rapidly recruited, when once the name of Dr. Perry had been authoritatively announced as the commander of the new regiment. Among others, Lieutenant B. R. Corwin had early begun to recruit a company in Brooklyn, under the personal authorization of Colonel Perry, and Captain D. C. Knowles had opened in July a recruiting office in Trenton, N. J. Others in Monmouth County, N. J., and along the valley of the Hudson had gathered little groups of men, and when they learned that Dr. Perry was forming a regiment they gladly offered themselves and their men. Many religious parents, fearful of the moral contamination of army life for their sons, gladly heard of a regiment to be commanded by an eminent minister, and sent their sons to join in. Undoubtedly, that was how the organization gained its quaint sobriquet of "Perry's Saints." As the formation of the regiment was made largely about the personality of its first commander, we will here give a sketch of his life. James H. Perry was born in Ulster County, N. Y., June 18, 1811. He inherited from a Welsh ancestry splendid natural endowments, both intellectual and physical. He stood fully six feet in height, broad-chested, broad-browed, a man of noble bearing and of a courageous heart. He had early evinced inclination to a military life, and received an appointment to cadetship at West Point from President Jackson in return for political services rendered by his father. There was a delay in the forwarding of his credentials, and, supposing that he had failed to receive the promised appointment, young Perry began the study and entered upon the practice of law. He also married. When his appointment finally reached him he instantly relinquished the pursuit if law, and entered West Point. There his independent and manly character brought him into frequent difficulties, as he would resent the insults the Southern cadets were accustomed to heap on the boys from the North. He did not relish being called a "mudsill," and he never was called it a second time. He became a sort of leader to the nobler of the Northern boys chafing under the affronts they habitually received. In one encounter with several of the Southern cadets, who assaulted him in a most cowardly manner when he was unarmed, he barely escaped with his life, but thoroughly whipped his assailants. For that fight he was court-martialed, and sentenced to be dismissed from West Point; but President Jackson, himself a brave man who could appreciate the courage of a brave boy, not only annulled the sentence, but wrote a letter commendatory of the manly conduct of young Perry. During his third year at the Academy he resigned his cadetship, and at the breaking out of the Texas rebellion against Mexico espoused the Texan cause. Perry was commissioned a colonel in the Texan army, and authorized to raise a regiment at the North. He only succeeded in raiding part of a regiment, which he took with him to Texas, and with which he served with great and conspicuous ability. At the battle of San Jacinto there occurred an incident which changed the career of Colonel Perry from that of a man of war to that of a man of peace. General Santa Anna, the commander of the Mexican army, had been guilty of such duplicity, craftiness, and cruelty that every officer of the Texan army had taken an oath to take his life if they met him in battle. The reason for that desperate determination was the atrocities of Santa Anna at Goliad and at the Alamo. At Goliad he had butchered in cold blood the entire garrison after it had surrendered, and upon capture of the Alamo he had put to the sword every one of that gallant garrison, sparing only one woman, one child , and one servant. Because of these barbarities, the Texan army had declared him an outlaw and a bandit, and the Texas officers had bound themselves by an oath to kill him at sight. At the battle of San Jacinto, where Texas independence was finally won, Colonel Perry commanded the left wing of General Houston's army. The battle cry of the brave Texans was, "Remember the Alamo." In the battle Colonel found himself opposed to a general whom he supposed to be Santa Anna. He rode towards his, and, in a hand-to-hand encounter with swords, killed him. After the battle, when Santa Anna was brought into the Texan camp a prisoner, Colonel Perry learned that his antagonist had been the chief of staff of the Mexican General, and that he had slain unwittingly an honorable soldier. Stung with remorse, he instantly withdrew from the army and came back North. That mistake in the identity of his antagonist at San Jacinto had a singular effect upon Colonel Perry's whole career. Brave as a lion, he was as a woman, and a cloud of remorse for that act shadowed his noble life from that hour until the day in Fort Pulaski when he died. His most intimate friends have always believed that it was this that led to his conversion, and the dedication of his life to the Christian ministry. On returning North after the Mexican War he settled in Newburgh, on the Hudson. "In the early fall of 1836, on a call at Newburgh, I found great interest because of the Sunday night previous. At the close of the sermon in the Methodist church a prayer-meeting was commenced at the altar. The pastor, Rev. Seymour Landon, gave an invitation to any who desired to give their heart to the Lord to come forward. Colonel Perry, who had recently returned from Texas, sat in the middle isle, near the door; he instantly rose, and deliberately walked to the altar and knelt for prayers. The man, so conspicuous for his elegant and lofty bearing, wearing the badge of his military office, manifesting so fearlessly his decision, awed the congregation, thrilled the church, and made such an impression that it became the topic of conversation throughout the town. He sincerely was seen in his docility; he sought and followed the advice of his pastor and his brethren. In less than two years from his conversion he was admitted on trial in the New York Conference, and began to preach. His first appointment in 1838 was Burlington and Bristol Circuit, Conn. The usual military parade took place that fall in Burlington, and the Rev. Mr. Perry was invited to act as chaplain. At the session of the New York Conference in 1841, held at the Mulberry Street Church (now St. Paul's), New York City, the preacher assigned to fill the pulpit on Sabbath evening failed to appear. Colonel Perry was asked to take his place. In the spirit of the military and ministerial discipline he obeyed orders. The ability he exhibited won for him an invitation to become a pastor of that church. He was not yet elected to the elder's orders, and yet he filled what was then, the most important appointment of the Conference with conspicuous success. Afterwards he was always assigned to the principal churches. The magnificent physique and marked characteristics of Dr. Perry were elements in the power and efficiency of his ministerial career. In any assembly of men he was likely to be the most noted figure in it --a Saul among his brethren. Tall, well-proportioned, with a large head, full clear blue eyes, a countenance expressive of intelligent manliness, benignity and kindness, and a native dignity and grace of bearing and inspired confidence and respect, with nothing of that pomp and stateliness that repels --these but poorly indicate the character and proportions of his mind and heart. He was noble and manly in all his traits; in his attachments firm, constant, and reliable; the soul of honor and courage, always courteous, always a gentleman. Such a man he was, and he brought himself, his gifts, training and attainments into his work as a minister. Many can testify in all the churches to his great usefulness. He was a man of strong nature, had decided opinions, and possessed fine ability as a ready, dexterous, and cogent debater. He was a zealous advocate for lay-delegation in the Methodist Church. He received from Dickinson College in 1844 the degree of D. D. His manner in the pulpit was calm, dignified, and impressive; his style was distinguished for its clearness, accuracy, and vigor, and for historic and classical allusions." This was the Christian minister who was to become the first commander of the Forty-eighth Regiment, whose name was "a tower of strength" in its recruiting, who was to lead them to the front, and after ten months of noble service at their head, was to die amid their love and tears, and to live in their memory forever. From the day that Colonel Perry's name was announced to command the new regiment the work of recruiting went rapidly on. Lieutenant-Colonel Barton made a journey to Washington, accompanied by the Hon. 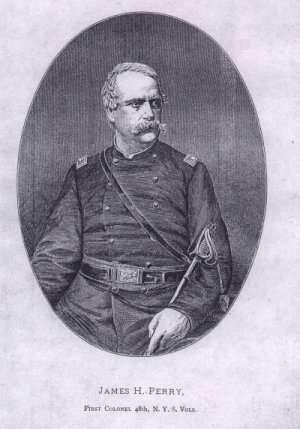 Moses F. Odell of Brooklyn, --an early and loyal friend of the regiment, --and received a promise from the Hon. Simon Cameron, then Secretary of War, that when more troops were needed the men they were enlisting would be accepted by the Government. On July 24, 1861, the first recruits went into camp at Fort Hamilton, Long Island. The camp was named "Camp Wyman, " after Mr. Luther B. Wyman of Brooklyn, our early friend and patron, whose interest in us and zeal to promote our welfare never wearied. The regiment was designated originally the "Continental Guard, " the design being that it should be independent of any State--and that is why the overtures of its projectors were made to Washington rather than to Albany. That idea was, however, soon abandoned, as the general policy from the Government was to obtain its soldiers in given quotas from several States. Before President Lincoln had issued his famous call for three hundred thousand men to serve "for three years or duration of the war," under which the Forty-eighth New York was mustered into the service, the noble men who were at work recruiting it had expended between two and three thousand dollars of their own money, and had been liberally aided by Mr. Wyman with means to establish the camp at Fort Hamilton, and to procure blankets and other necessities for the recruits. Soon, however, their faith was to have its reward. On the renewal of the application to the War Department word was received from Governor E. D. Morgan, the great "War Governor" of New York, that when the regiment was properly officered and organized he would come at once and give it its number and muster it into the service. Finally, on August 16, 1861, the first three companies were mustered in, namely, companies H, I, and K. afterwards the companies were mustered as fast as their quota of men was filled. Companies A and D, August 21; Company G, August 26; Company E, August 27; Company F, August 32; Company B, September 5; and Company C, September 10. The time at Camp Wyman was spent in drill, and by the officers in studying tactics. The writer remembers the night when he first arrived there --on July 30, 1861. Only one tent, such as a sutler afterwards used, --where all of us slept on the straw with feet towards the centre. We recall a visit of inspection at Camp Wyman by Governor E. D. Morgan and his staff. Among the staff that day was a brilliant young gentleman by the name of Chester A. Arthur, late the President of the United States. The officers of the "Continental Guard" gave a fete champetre one evening before we left the camp, which was a fine affair. The only officer, except Colonel Perry, who seemed to have had any elaborate military education (although Lieutenant-Colonel Barton and several others had belonged to the Seventh New York State Militia, and some to other militia regiments.) ws Lieutenant Elfwing, a Swede, a graduate of the Royal Military Academy of Sweden, and a very skillful swordsman, whose service with the regiment was destined to be long and conspicuous, and who is now the U. S. Consul at Stockholm, Sweden. The regiment took form in those days at Fort Hamilton, company by company, and at the final muster it received its number as the Forty-eighth Regiment, New York State Volunteers. "I had been making a brief call on Colonel Perry, at his headquarters in Brooklyn, and when leaving the thought occurred to me that it would be a handsome thing to do if the ministers would present him a horse, caparisoned and ready for use. At once I commenced raising a subscription. The preachers about New York readily subscribed 85 cents each, and Judge Fancher gave me some $60. I had but little trouble in raising the money, but a very hard time in finding a suitable horse for that kind of service. We tried many horses. An old farmer in Ulster County sold me an unsound horse and I prosecuted him, and he was glad to settle and refund before the suit came to trial. Finally, a thorough horseman came and volunteered to get me a horse; and he found a good one, for which I paid $180 (the horse afterwards sold for $2480). Betts of New York City made the saddle, bridle, etc., for which we paid him $60. One bright Monday afternoon I rode the horse down to Fort Hamilton. The regiment formed in a hollow square, and I made the presentation speech from the saddle, to which the Colonel made a brief reply, and mounted his charger and rode away, and that was the last I ever saw of my genial and much-loved friend, Colonel Perry." All will remember the scene thus described. Dr. King is a man of magnificent physique, not unlike that of Colonel Perry, and when one dismounted and the other mounted the noble steed --which we all came to love --it was a sight to remember. Finally on September 15th, orders were received for us to proceed to Washington; and on September 17th the regiment left Fort Hamilton (964 strong) for the front. Chaplain -- Wm P. Strickland, D. D.
*Assistant-Surgeon Humphries name is given here in order to complete the staff, although, in fact he joined the regiment a little later.